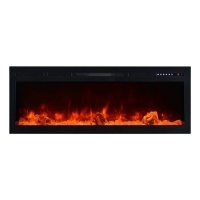 Ultra modern SL50-B fireplace has 12 different flame color combinations to choose from! The colors project onto a gray back screen and shimmer through the ember bed creating crisp clean flames through the whole color spectrum. Modern multicolor glacier crystal glass finishes off the look of this sleek fireplace. Thermostat, touch control and remote comes standard with SL50-B fireplace making the operation of the fireplace a breeze!